It's been said that it doesn't really matter where you get drafted. Essentially, the theory is that everybody starts from zero the next day and needs to work their way up the prospect ranks of the team that selected them to eventually get a crack at the NHL. For defenseman Kevin Gravel, he hopes that's the case. Originally selected in the fifth round of the 2010 NHL Draft, on paper, the odds appear to be stacked against him ever wearing a Kings jersey. A quick look back at some other players nabbed by L.A. in the fifth round reads like a graveyard of broken dreams - David Goverde, Pauli Jaks, Jeff Shevalier, Chris Schmidt, Greg Hogeboom, Brady Murray, David Meckler, Andrei Loktionov, David Kolomatis... seriously, need I continue? Yet, scouts and those who follow the game closely will tell you Gravel has a far better comparable than any of the names just mentioned. Enter Robert John Scuderi, fifth round selection in 1998 out of Boston College. "Now you've got it, that’s the comparison for Gravel," said Mark Yannetti, Co-Director of Amateur Scouting for the Kings. Hold on though. Before you get a mental image of blood dripping down Scuderi's face in Game 6 of the 2012 Stanley Cup Final, slow your roll just a bit. Gravel doesn't have that hard of an edge. "I think the way that Kevin plays right now, that might be a more...," Yannetti paused, choosing his next words carefully. "Scuderi’s a little more of a hardened, I don’t want to use the word ‘warrior,’ because I don’t like the word. If people are warriors, if they screw up, they die. People who are soldiers, they’re fighting for something different than an NHL guy is. When you talk about sandpaper and grit, I don’t see [Gravel] having Scuds’ sandpaper or grit yet. Scuds didn't have that at Boston College though, and he didn't have that in the minors, or his first three years in Pittsburgh. Scuderi in L.A., was not the Scuderi early on in his career, but something changed. He was never soft, but something changed in him." So, there's still time for Gravel too. For now, he's a solid, stay-at-home defenseman. Currently a senior at St. Cloud State University, will he also become grittier as he continues to develop? That remains to be seen, but the comparison is there for the taking and it's something Gravel certainly welcomes. "Obviously that's not one I would disagree with or not be happy about," he said. "Scuderi’s a guy who always plays extremely solid in the defensive end. He was just back there being a solidifying factor for Drew Doughty during his time in LA. Kind of his escape route, his safety net there. He has such a good stick and that’s what I try to focus on. I try to take care of my defensive area first and make sure I don’t get scored on when I’m out there, try to always be in the right position and have my stick in the lane and then block a shot when I have to." Coincidentally, there's another Kings prospect Gravel has been linked to as well - Derek Forbort, selected in the first round of the 2010 Draft. However, in this case, the two have more often been compared against each other, not as like players. And why not? They're about the same height, were part of the same draft class, spent the last three years on rival teams in the same conference and were even teammates on the USA World Junior team. At 6-foot-4, you can't miss Gravel when he's on the ice. Defensively, he's about as sound as any player you'll find in college hockey at the moment. The funny thing is, he just as easily could have ended up playing forward. "My dad is in the 100-point club here at St. Cloud. He was a 5-foot-10 forward though, so we’re complete opposites," joked the younger Gravel. Indeed. 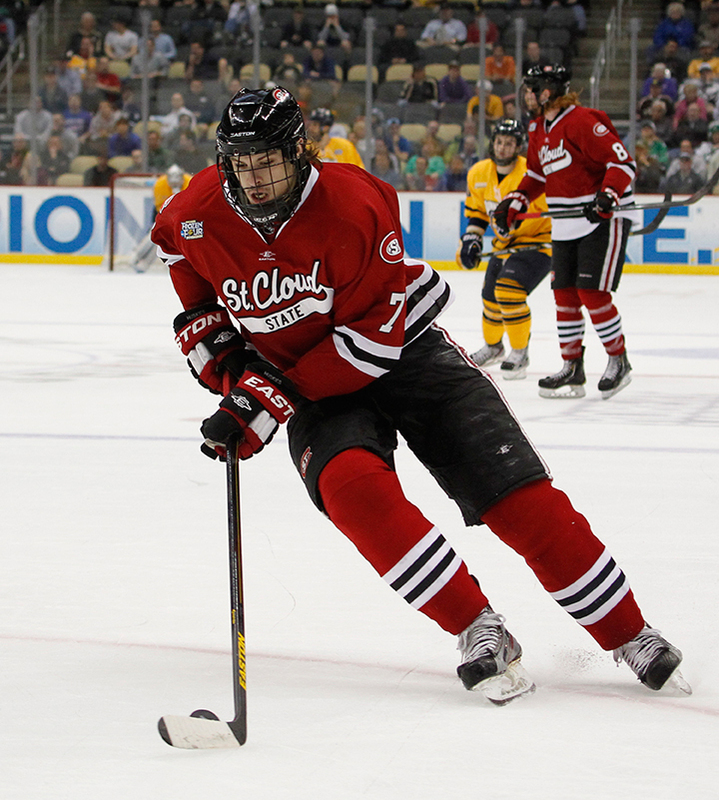 Son Kevin recorded only one goal in each of his first three seasons at SCSU. Still, since first landing on the Kings' radar, the team has continued to be impressed with his raw skills. Yannetti credits Tony Gasparini, Kings' U.S. scout, for first turning him onto Gravel, back when he was playing for the Sioux City Musketeers in the USHL. "They talked to me after a few games throughout the year and then I had an interview with them at the NHL Draft Combine," remembers the now 21-year-old defenseman. "I had been in contact with them, so I knew there was some interest." Following the Draft, Gravel was soon off to St. Cloud, not exactly one of the nation's power house schools at the time. Yet, that would all change in the coming years. Emphatic that the Huskies had a program on the rise during his early days on campus, Gravel's hunch has proven to be true. Last season, they went all the way to the NCAA Frozen Four, eventually losing to Quinnipiac in the game that decided who would play Yale for the national championship. He didn't have much time to sulk over the loss though. Gravel soon had a very difficult decision in front of him. Would he skip his final year of college eligibility and turn pro? "I talked to Dean [Lombardi] and guys like that," Gravel shared. "They just said it’s up to me and would support my decision either way. Basically, when you hit that type of decision, it’s a life changing decision. You have to take a step back and we were fresh off a loss just a few days before. So there’s still emotion left in the loss and feelings, you give it some time to get over the loss and get over the season and reflect on everything." After consulting with his coach, his parents and sleeping on it for a few days, Gravel chose to stay. "Ultimately, I felt coming back, I was going to be a guy who’s looked upon to be one of the main players here and I was going to get a lot of ice time, which is big for a guy like myself. I need ice time and I need to be able to play to continue the development path I’m on. I thought I could still develop here in St. Cloud and I thought that ended up being the best decision. So far, it’s paid off for me." It has, for sure. Gravel now wears a letter, serving as co-captain. While it's still too early to say with a definitive tone how high Gravel's ceiling is, he's projecting out as a 5-6 defenseman in the NHL. 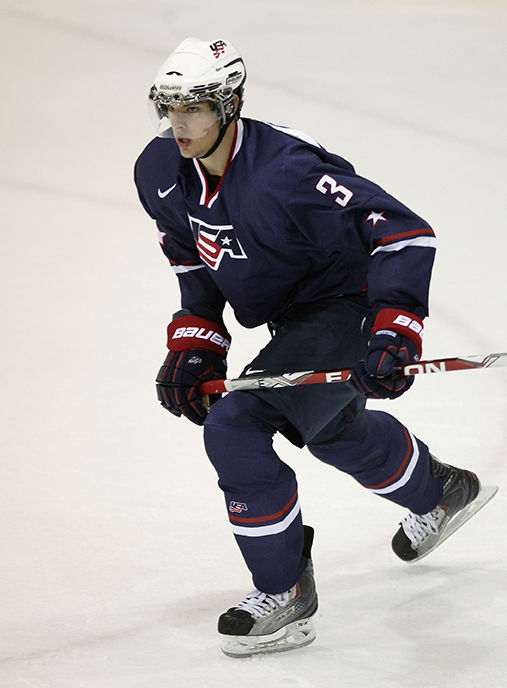 "I actually think that Kevin Gravel is very undervalued for what he could end up becoming in the NHL someday," Yannetti remarked. "You can go with the adage that there are 30 D1s because there are 30 teams, but there aren’t. There’s only eight to 10. I think the same can be said for D5s and D6s. You get a lot of D5s and D6s who are vanilla, just parts, that don’t fit the role the way that a certain team, or the way that the L.A. Kings want the role fit. You see a guy like this, and he’s not vanilla. He can skate, he can make a play. He’s very long in terms of the way that he defends. If he hits his potential physically, he might be 225 to 230 pounds. So, now you’ve got a guy who defines himself in that role if he hits." Once he got going, Yannetti gave a sermon on Gravel reminiscent of a top athlete's representative on the eve of Free Agency. "He defends long. There are plenty of six foot five guys, plenty of six foot three guys, who don’t defend long. He uses his stick with little subtleties, creating a defensive perimeter. If you watch the defensemen in the minors and in the NHL, they allow forwards to stickhandle in what I call their defensive triangle. It’s like a boxer’s reach. If a boxer has a great reach and he doesn’t use his jab, guys can come inside and start busting him up. Same with a hockey defenseman. If he has a great reach, but a lazy stick, or he holds it too close to his body, or he’s not active with it, guys can stickhandle inside his triangle, which now turns him from a 6-foot-5 defenseman to a 6-foot defenseman, no matter how physical he is. With Kevin, I saw that he defended long. I thought he defended long against the rush and I thought that he defended long in the zone, in the defensive half-court. I saw hints of a complete defensive game, where he might not have been as physical as some guys, but he established the same type of perimeter, just in a different way." This year, the parallel path with Forbort has splintered into different directions though. Forbort turned pro and is playing in Manchester, while Gravel came back to SCSU for one more crack at a national championship. "That would mean everything to me," Gravel said, lighting up like a kid on Christmas morning. "It would solidify my decision [to stay]. The Frozen Four last year was so surreal and it all went so quick with us losing in the semis. We were there and gone before we even knew what happened. Looking at the greater picture, being able to make it back there this year, would show that last year wasn’t so much a fluke for St. Cloud, but that we really are a program that is going to be here to stay, a program that needs to be taken seriously. To go to the Frozen Four two years in a row would be a statement and to ultimately win a national championship would be... I can’t even put it into words. It’s everyone’s ultimate goal who is playing college hockey. To be able to do it your senior year, it would be very surreal." It would also bring the Scuderi comparison back to full circle. The future two-time Stanley Cup Champion completed his Boston College career by defeating defending champion North Dakota, 3–2, in overtime of the 2001 national title game. Gravel is hoping to once again mirror Scuderi later this spring.